Our Gambler’s Help Eastern team had a very hectic schedule during one of the most important weeks of the year to raise awareness of Gambling Harm in the community. The team are attended/held 16 events during this week across the Inner and Outer East areas of Melbourne and linking with some activities for Mental Health Week. EMHSCA Mental Health event in Box Hill Town Hall and holding a stall at the Batesford Hub in Chadstone. Team members are assisting at the Salvation Army in Camberwell and HICCI in Healesville. Finally they will be out in force at Ringwood station combining with mental health activities on the Friday evening. Gambling is becoming so normalised now that it is perceived as part of the game. 1:5 Victorians who gamble may be experiencing harm from gambling? 71% of Victorians think adolescents are exposed to too much gambling advertising? 1: 4 children can name 4 gambling brands or more! Betting has become so normal that an 8 year old child watching AFL footy today will have never seen a game without gambling odds! Problem Gambling has now been recognised as an addiction like any other and gamblers need support in order to regain control. 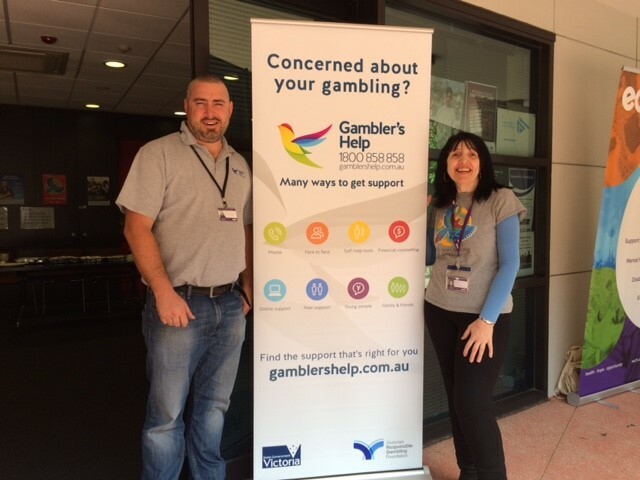 The Gambler’s Help Team offer Financial Counselling, Therapeutic Counselling and community education and have Venue support staff who go to hotels and gambling venues and train staff to recognise and assist people showing signs of gambling harm.